We developed grounding techniques to manage situated knowledge, i.e., knowledge specific to a particular location, for complex instruments [2, 4]. To resolve the Perspective-2-Point problem, we used a three-axis orientation sensor. Although we are using only two features points, we have conducted a set of experiments showing that this method provides good results, comparable with other approaches using more feature points [3, 5]. Moreover, we proposed a low-overhead 3D items drawing engine . It consists of a hand-held Augmented Reality (AR) system and allows to directly draw, in the context of a subject instruments, free 3D lines. A line is recorded as a set of sample points. From these points a volume can optionally be interpolated by performing a Delaunay tetrahedralization. During the drawing operations, a physically concrete version of the instrument is not required. In addition, we proposed an MR system for situated knowledge management , for 3D items creation /importation and animation that is a component of a situated knowledge medium aiming at supporting knowledge communication between the different actors involved in the operation of complex instruments (Fig.1). 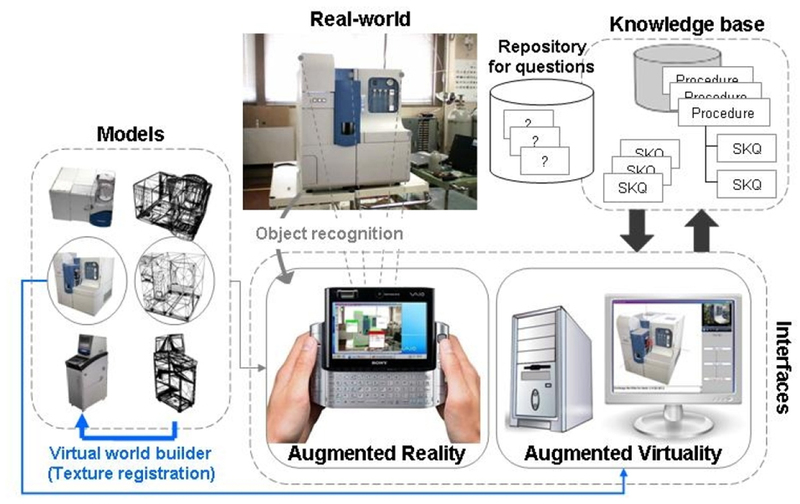 ﻿Fig.1: Augmented Reality system to manage situated knowledge for complex instruments. Loic Merckel and Toyoaki Nishida: Multi-Interfaces Approach to Situated Knowledge Management for Complex Instruments: First Step Toward Industrial Deployment. AI & Society Journal. Springer London, Volume 25, No. 2, pages 211-223, May 2010 (http://dx.doi.org/10.1007/s00146-009-0247-9). Loic Merckel and Toyoaki Nishida: User-friendly Texture Mapping Engine. Journal of the Institute of Image Information and Television Engineers (ITE). Volume 63, No. 12, pages 1838-1846, December 2009. Loic Merckel and Toyoaki Nishida: Enabling Situated Knowledge Management for Complex Instruments by Real-time Reconstruction of Surface Coordinate System on a Mobile Device. AI & Society Journal. Springer London, Volume 24, No. 1, pages 85-95, March 2009 (http://dx.doi.org/10.1007/s00146-009-0200-y). Loic Merckel and Toyoaki Nishida: Accurate Object Recognition Using Orientation Sensor with Refinement on the Lie Group of Spatial Rigid Motions. IEICE Transactions on Information and Systems. Volume E91-D, No. 8, pages 2179-2188, August 2008.